I hadn’t had a piece of coconut burfi in ages. If I remember correctly, the last time I had this burfi, or any burfi for that matter, was when I was in India. It’s been so long! We normally do not buy sweets or other similar preparations from the Indian stores here because we are never happy with the quality and/or the taste and appearance. I am also not the kind of person who cares enough to put in all the effort required to make such things at home. However, the other day when I was craving something sweet after dinner, I just had to give in and make this. Line the inside of a pan with some aluminium foil and grease well. Take a heavy bottomed vessel and add the milk, sugar and coconut. Cook on medium heat and stir the mixture well. Add a pinch of salt so as to bring out the flavor of the ingredients. Continue stirring till the sugar melts and all the milk is absorbed by the mixture. This took me about 35 minutes or so. Add the powdered cardamom and mix well. Continue mixing for another 5- 10 minutes till the mixture thickens and comes together in a fudge-like consistency. Turn off the heat. Transfer the mixture to the previously greased pan, spread uniformly and allow it to cool. I had to refrigerate my burfis for a couple of hours to get a reasonably decent consistency. It probably had to do with the fact that I only use low-fat milk. Using whole milk would probably produce burfis which are firm and have a slightly better texture. Maybe some more sugar too would have helped, but it was sweet enough already. That being said, it was simply delicious and I ate a few bits and pieces even before refrigeration!! After refrigerating for a few hours, cut into squares, garnish with almonds and serve. This recipe yields about 10 pieces. I am sending this to Viji as my contribution for RCI-Tamil Festivals for celebrating Diwali. Yum...so glad I happened across your blog! I can't wait to explore more of your recipes and lovely pictures. Thanks for blogging. Thats a fantastic recipe! I like the way you explain the importance of simple things like that pinch of salt! Thats what i really love about your recipes. The colour is so white which has made the sweet look so divine and beautiful,Tbc! !Love the burfis!! Wowie.. this looks so good! Am sure the milk lent a rich creaminess to it. Lovely. hey, lovely ones. Its come out so white too... hmm, lot of sweet posts today in the blog. 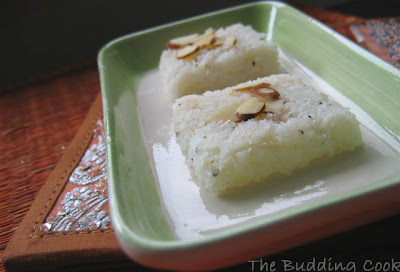 Your burfi looks delicate and delicious and the lighting in the picture makes it even more inviting. I'm running into all kinds of coconut recipes tonight as I surf my favorite blogs! Very interesting recipe! 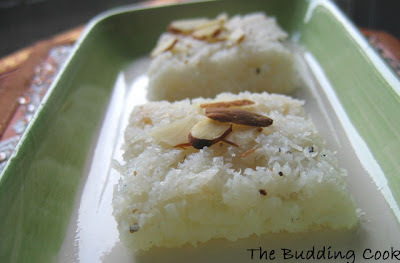 Nice coconut Burfi's. Try using condense milk along with 2% or even Khoya. It will give the right consistency. Beautiful picture. beatiful little burfis, TBC, would love to try it..
Beautiful pic. My sister loves these. very beautiful presentation! looks so fantastic! hiii,burfi is lovely and invitating....i had burfi.. donnooo can't rember ,err...may be years ago....really missing india..mainly coz of sweets n mom's dishes.i too agree wid u,on my hubby's b'day,bought sme sweets from an indian stores,it was very horrible...no taste,no flavour nothing...then i made kesari for him...will try ur burfi next occasion.. I am imaging the refrigeration after a few hours and this chilled coconut dessert. Yums! Even I don't buy sweets from Indian stores. The picture of coconut looks beautiful! Seems perfect burfi, ummm.....very tempting. They are similar to a delicious Brazilian type of candy, that I will post this week (hopefully). Mouthwatering and beautiful - I love coconut! I haven´t had this one. Looks tasty! Hi TBC, I'm a gr8 fan of coconut barfi, and its been a long time since i too had some of it, i now will make it at the weekend for my family.. Thanks for the recipe.. I use mava instead of milk but I think next time I use milk for this recipe. Nice entry for this festival. Beautiful pic. Great entry for this RCI Event. Looks fabulous!!! Thanks for sharing. Hey that looks like it will just melt in mouth...!!! I too don't like the store bought sweets here in US. Yours look so good. I agree with Rak's. Sure looks like a melting one in mouth. HC- yeah,if you want to eat good sweets,either get it from India or make your own. Laavanya-it was good but I wish the texture was the same as yours. Shivapriya- You know, I even had condensed milk! I don't know why I didn't think of that:-(. Oh well, there's always a next time:-) Thanks for the tip. Sharmi, thanks. Hope your little one is alright now. Mansi- I know! I think it's because it's one of the simpler sweets one can make:-)... and it tastes so good too! I checked out your keasri... looks great. Tigerfish- thanks for stopping by. Kumudha-We bought Jelabis once and I had to spit it out. They had an off-taste. EMWK-Do give it a shot. you might want to use sweetened condensed milk (instead of milk +sugar) for a better texture. Mona- do try it. Maybe u should use condensed milk as Shivapriya said for a better consistency. Do let me know how yours turns out. Great pictures, I would like to taste both. These look great...and that dish they are in is so pretty, It's such a nice picture! Meeso- It's nice to have you here...and thank you! thats one tempting burfi i ever saw. mascarpone is our fav! great recipe- pics look delectable. Adding salt is a good idea. You are right...it might be becoz of 2% milk. Burfi with that plate looks very attractive. Have never seen such thin slices. Nicely done. am doing well.Since two days feeling better. Hope to see u soon. Your recipe reads far easier than the one I followed. It's lovely and will be the one I try when I make burfi again...and I will! Thanks, TBC. It is easier but I was not too happy with the texture. Maybe sweetened condensed milk and small amounts of sugar would be better than what I have used?